In her long career as an essayist, Ehrenreich has been a vocal critic of economic injustice and a staunch supporter of the working poor. In 1998, when she was over fifty, financially comfortable and established in her career, she chose to take an editor up on his challenge to spend three months working at the bottom of the economic ladder, living only on what she earned. Ehrenreich went “undercover” in Florida, Maine, and Minnesota, working as a waitress, hotel maid, and WalMart “associate,” and found it even harder than she expected to make ends meet. There are no “hidden economies” that support the poor. Some of her coworkers were homeless, living in vans in the parking lot. Many were dizzy from hunger, trying to make it through the day on little or no food. Yet she found her coworkers to be generous, hardworking, and conscientious, to the point that management, with its useless drug tests and petty rules, was often more hindrance than help. With this accessible, even entertaining book, Ehrenreich shows her readers a world most will never experience firsthand, bringing home the reality of the widening gap between rich and poor and the human misery upon which our economy depends. Fans of the actor and comedian won't see in his first novella much of the wild and crazy guy they know, but they will be impressed with his versatility. The story Martin tells is of yet another fifty-year-old man who beds a woman half his age and leaves her enriched by and grateful for the experience, but the author's delicate touch and intellectual insight shed some new light on an old subject. His title character, Mirabelle, is a shy and skittish artist, and the story has enough dark shadows in it to keep it from being just Pretty Woman for the literati. Martin sets part of the story in Vermont, revealing a gap in his research: Mirabelle flies in and out of what appears to be a large, full-service airport in Montpelier. Most of the action, however, takes place in Martin's beloved Los Angeles, and his fond jabs at California culture glitter with the comedian's quick wit. Change is coming quickly to the coast of Newfoundland in the early nineteenth century, as the European settlers there encounter the Beothuk, or Red Indians, native people rapidly dwindling in number. In writing his novel, Crummey drew from actual accounts of the period, turning history into literature, with lyrical descriptions of a world vanishing forever. The fear and mistrust between the Indians and the white men weighs heavily on every member of a clan of English colonists, who make their living trapping and fishing. Lieutenant Buchan, the Scottish Navy officer committed to bringing a peaceful end to the conflict, struggles at the same time to make peace with himself. Cassie, the housekeeper, seeks solace in literature, her self-protective distance as one of the few women in the settlement having become an unbridgeable gulf between her and other people. John Peyton, the respected patriarch, is haunted by nightmares of the past, with a grudge against the Indians that he can't shake. And there is John Peyton Junior, his son, making his way to manhood and struggling to do right, who on one fateful trip, captures a Beothuk woman. Crummey tells a human story, with language as beautiful as the wind in the trees and images of startling violence that reveal the cost of life in this new world. 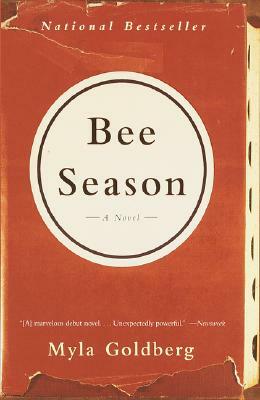 This beautifully written first novel is creating a buzz among word lovers. Ten-year-old Eliza, an exceptionally ordinary young girl, is as surprised as everyone else when she wins the class spelling bee and moves on to the national finals. Her father, believing her to be the next great Jewish mystic, sets out to hone her gift with an unusual method for mastering spelling. While their studying brings them closer, he doesn't notice his wife and son becoming lost in their own spiritual quests. Just as every word is composed of discrete letters, each with a unique character, this modern family is made up of four individuals bumping up against each other, each with their own compelling story.